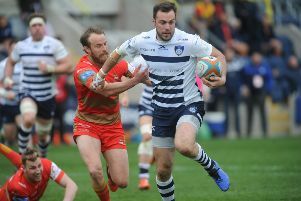 Leeds Beckett captain Connor Lloyd insists his team are more than a match for holders Hartpury as they prepare to do battle in the Yoti BUCS Super Rugby Championship final Yoti at Twickenham today. Sitting at the foot of the league table in December, it had, at one point, seemed impossible that Leeds Beckett would still be gunning for glory at this stage of the tournament. But a stunning 11-game winning streak has the whole squad believing they can pull off the impossible on Wednesday. “On paper we may be the underdogs – but coming into the game on such a brilliant win streak, we have a fighting chance,” Lloyd said. “With the form we’re in and the players we’ve got, we have a real shot at winning. “When you play at such a stadium, form goes out of the window and it’s just about who wants it more on the pitch. It was after a 30-3 drubbing at the hands of Cardiff University that the captain decided to shake things up. And while not a drastic overhaul by any means, bringing the squad together clearly had a binding effect on the team at the turn of the year. “We had a meeting after the Cardiff game – it was nothing major, but we set goals and refocused our mindset going into the rest of the season,” Lloyd said. Despite the 2015 BUCS Rugby Union Champions losing 43-17 to today’s opponents earlier in the season – at a time when just one point separated them in the table – Lloyd believes a change in mindset means a repeat result is not on the cards. Instead, they are taking notes from Daniel Grange – part of that winning side four years ago – ahead of the Twickenham showdown. “Daniel’s in his last year here as he stayed on for a Master’s degree,” he added. “His experience is really helpful for the boys – he’s been telling us exactly what it was like in 2015 and giving us tips. Leeds Beckett’s story is one of growth – instead of players entering the institution experienced in their craft, players have advanced through the ranks, much to the credit of the university. Lloyd added: “A lot of the first-team players have come from the 4th and 5th XV and grown throughout the years to make the top squad. His side may not be making any special preparations for their trip down – but Leeds Beckett will certainly go into the lion’s den today as a fired up and fearless squad.